Chromium is an essential trace mineral that works with insulin to support healthy blood glucose levels and plays an important role in the proper utilization of protein, fat and carbohydrates. Taking supplements of chromium picolinate could help people with depression manage some of the symptoms, including mood swings, carbohydrate cravings, weight gain, and lethargy, suggests new research. Chromium is sometimes referred to as glucose tolerance factor (GTF) because of the vital role it plays in the metabolism of sugar for energy. It maintains stable blood sugar levels by regulating the workings of the hormone insulin. Insulin is released from the pancreas, in response to sugar intake. It allows the intake of glucose by the cells as a fuel source. Without insulin sugar stays in the blood, and cells become starved for energy. The standard North American diet is high in sugar and refined products, as well as being deficient in blood sugar stabilizing substances like fibre. Eventually the pancreas becomes worn out and does not produce as much insulin or the body’s cells become intolerant after years of high insulin levels. Only one in ten individuals has a diet that includes a sufficient amount of chromium. These are important reasons why the prevalence of type II diabetes is increasing and the need for chromium supplementation is growing. Hypoglycemic individuals suffer from the opposite problem as diabetics; their blood sugar is too low. Chromium supplementation also helps these individuals regulate their blood sugar. The most active forms of chromium supplementation are chromium picolinate and chromium polynicotinate. 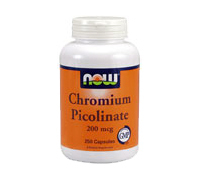 Chromium is chelated, or bonded, to the picolinate molecule or niacin, which takes it into the cell. Chromium GTF and chromium chloride are less active forms of chromium. In general most individuals are deficient in trace minerals for two reasons. The first is that our food supply is deficient in minerals. Our farms’ soils are depleted after years of farming without allowing fields to lay fallow and replenish themselves. The second is that many people consume filtered water. In order to remove contaminants, some of these processes also must remove the trace minerals. Distilled and reverse osmosis water are two examples of water that have had all of their minerals removed. Even those who are seemingly without any signs or symptoms of mineral deficiency will most likely benefit from replenishing their minerals. Health practitioners recommend trace mineral therapy to those individuals who drink reverse osmosis or distilled water, those with hair and nail problems, those with cardiovascular diseases, like hypertension and those with neurological or emotional problems. Adding Liquid Minerals the your drinking water.